I am following the advice in one of those blog help posts on what to write when you don’t know what to write. The advice was write what is on exactly your mind. Well, there’s a lot on my mind and I definitely feel the log jam of thoughts and so I’m recapping my week a bit, tring to avoid rambling and see if it leads to some follow-up posts. The Aaron Hernandez Situation – A Failure of Community? 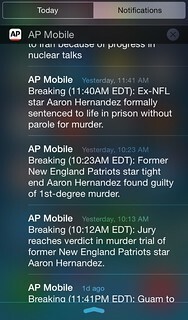 I was in our our Teaching Team meeting when my phone alerted that a verdict for the Aaron Hernandez was finally about to be announced. A few minutes later, another alert came through and I could scan the words, “Found Guilty of 1st- degree murder.” My first thought was that it felt like justice was served. For me, this wasn’t one of those moments where I needed to remember where I was when I heard the news. I did not even feel compelled to interrupt the thought of our meeting with this breaking news. What I was struck by however was who I am often in the room with and the disparity between a guy like Aaron Hernandez and me. I’ve been following the Aaron Hernandez case since the beginning. I am a Giants fan living in Massachusetts. I cheer against the Patriots (yes, congrats again on your well-deserved Super Bowl win, lucky you didn’t play the Giants though :). I love the drama, the rivalry, the players and the storylines found throughout the NFL. This part of sports culture is quite fun, it’s why we watch and follow. – I loved that our new series series unBELIEVEable is about faith and doubt. I loved being part of a church, that creates space for skeptics, seekers, and invites life-long believers to perhaps re-examine hidden corners of their faith. To be clear, I’m not trying to get people to doubt more as a final destination. The hope is for us to believe and deepen our faith more and more. But I, along with others, believe one of the ways we grown in our faith is by embracing our lingering doubts, exploring new questions and possibilities, confronting our ignorance, our fears our naïveté, our presuppositions and our weak beliefs. In short, exploring our doubts can lead to greater belief. Sometimes a particular doubt may be answered, sometimes it’s tempered, sometimes we find it to be no longer relevant and sometimes it becomes part of the journey. I hope you had a beautiful Holy Week. Mine began slow and contemplative then took off quickly. Among my highlights was spending a bit of time at our church’s Sacred Spaces. It’s a self-guided tour of various stations set up throughout our building for prayer and reflection. It’s hard to get to, even if you do work a few hundred yards away, but it’s so worthwhile. Grateful to the wonderful and talented people that make that happen every year. What If Judas Decided to Not Betray Jesus? Holy Week brings a number of thoughts to the mind. Among them are the various what if scenarios. This past Sunday, Pastor Bryan gave an amazing and forever-memorable monologue from Judas’ perspective. Instantly we find Judas back at the table at the Upper Room, shortly after Jesus is beaten and sentenced to be crucified. We see a bewildered Judas, guilt-ridden, and reteling the accounts from his mind. You can watch/listen to it here. It’s in these moments that we are reminded the Scriptures can come to life if we would let them. Personally, I love how the same story can bring various angles to a brilliant, deep truth. I love how the Holy Spirit illuminates, I love how the Word invites me to imagine, to consider, to press, and hopefully grows and stretches me as I live my faith and follow Jesus.